Let the Grand Princess be your oceanic host - it's just like the most luxurious resorts you've seen on land, except it takes you to exotic destinations! It features 700 balcony suites, an entire deck of Mini-Suites, impeccable service, delicious dining, and never-ending entertainment! For your next cruise vacation, you'll want to be on this grand ship! 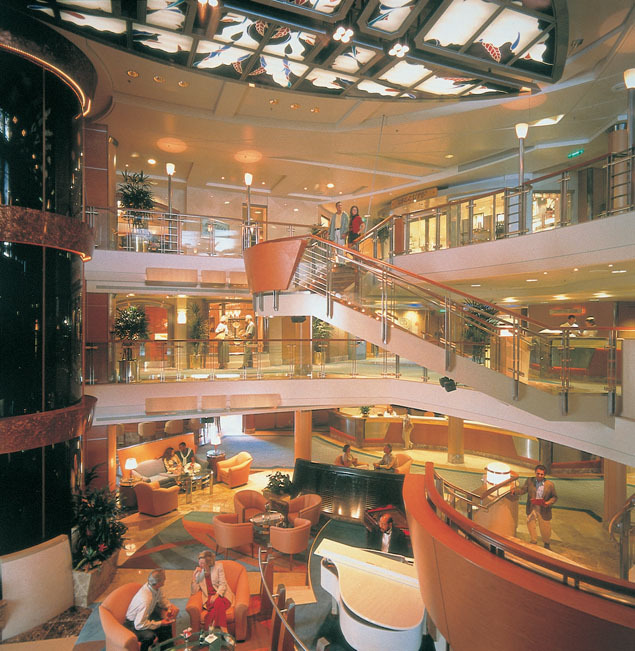 Book a cruise on the Grand Princess today! 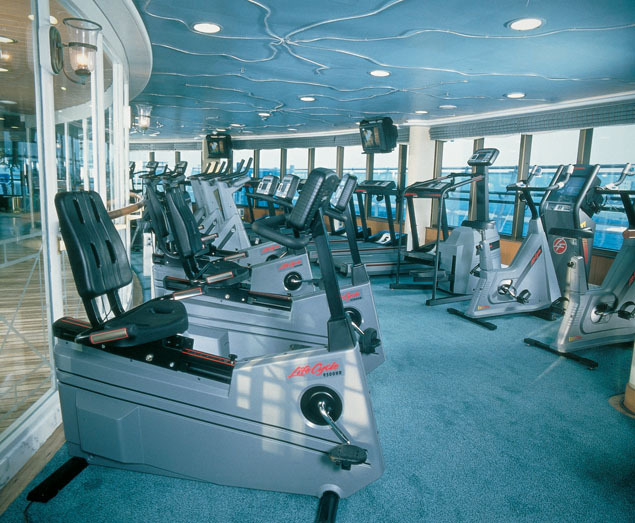 All the bases are covered on the Grand Princess - you'll have so many things to do you won't know what to do first! 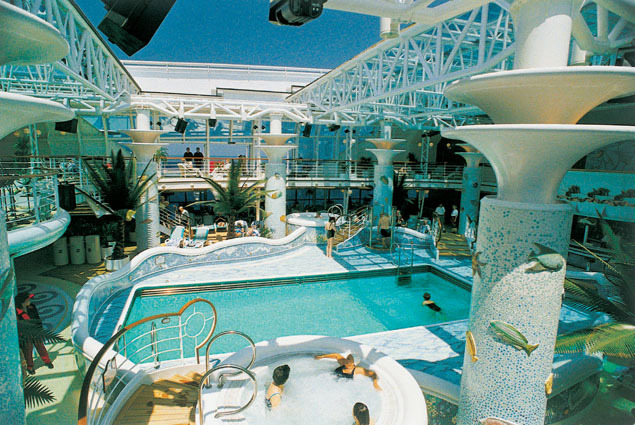 Relax and take in the sun by one of the glorious swimming pools on this ocean cruiser. The Calypso Reef and Pool has two hot tubs, and so does the Neptune's Reef and Pool! The Terrace Pool offers another great place to enjoy the sun and water, and the Oasis Bar and hot tubs are a good place to enjoy a cocktail and whirlpool! Pamper yourself at the Lotus Spa® and enjoy all of the spa amenities you could dream of! There's a gym and fitness area, a swim-against-the-current lap pool, a jogging track, shuffleboard, and a basketball court! Princess Links is a nine-hole putting course, and the ship also has virtual golf simulators, so you can practice your swing! As far as enrichment goes, your mind will be busy as well as your body! There is a world-class art gallery here, and a library. 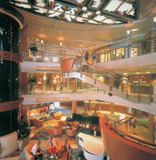 The 24-hour Internet Café offers wireless access, and the ship has a conference center! If you want to stimulate your brain, try the ScholarShip@Sea® program, where you can attend lectures and seminars ranging from cooking and dance lessons, to presentations about the history of the destination of your ship! The Grand princess makes learning fun! Finally, head over to the boutiques where you can pick up a souvenir and enjoy duty-free stores! The Princess chefs are culinary geniuses, and the same goes for those aboard the Grand Princess! Get ready for a treat - all of the dining options offer amazing food! Take the traditional dining option, and eat at the same time each day in the Botticelli Dining Room! Eat Anytime at the Da Vinci Dining Room, or at the Michelangelo Dining Room. 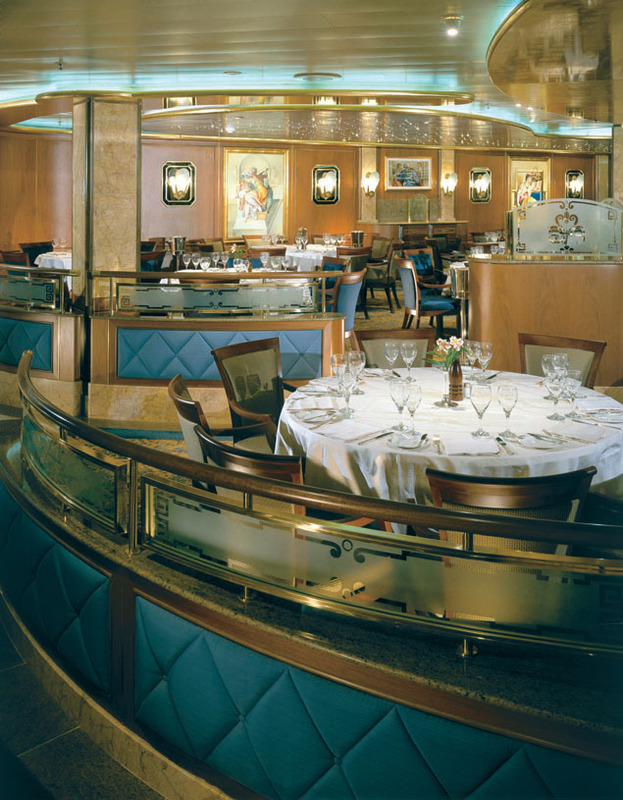 The ship even has Sabatini's, an Italian restaurant with great food, as well as Sterling's Steakhouse at Painted Desert for your favorite filet mignon! You can even enjoy your meal served hot with a gorgeous view with the Ultimate Balcony Dining program! Head over to the Wine Bar, the Lobby Bar (and patisserie), Poseidon's Pizzeria, or go to the Trident Grill for burgers and hot dogs. You can even get afternoon tea! The Horizon Court offers 24-hour dining so if you get hungry late in the evening, you can get yourself a midnight snack! 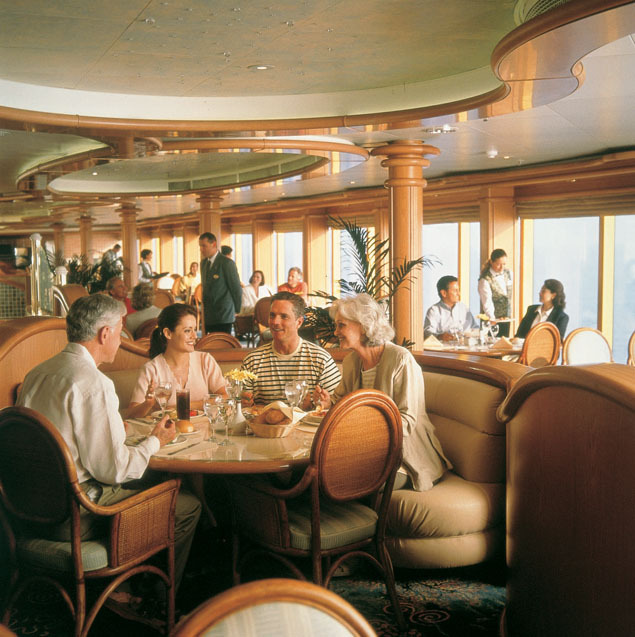 The ship also has 24-hour room service, so if you don't want to leave the comfort of your stateroom, you can have your favorite menu items delivered right to you! The Grand Princess has grand entertainment! Get ready for some amazing acts, cocktails, and music - and most of all, the time of your life! The Princess Theater is the ideal place to enjoy a live music show, or a Broadway-style stage production! Catch a comedy show at the Vista Show Lounge, or watch a movie at the Movies Under the Stars® poolside theater! 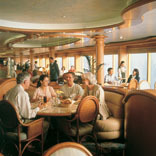 Head for a cocktail with your favorite people, and enjoy the Wheelhouse Bar, the promenade Lounge and Bar, and the Bacchus Bar! The Snooker's Cigar Bar also features great cigars for you to enjoy. 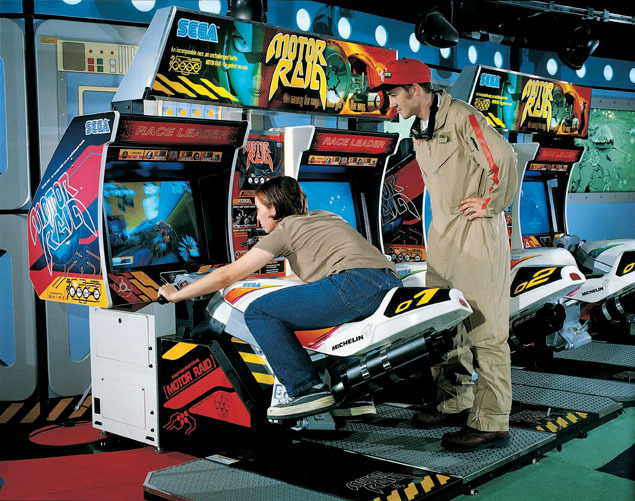 The ship is also equipped with a full casino, the Atlantis Casino - play your favorite games, they've got everything from poker and roulette to slot machines! The Explorers Lounge has nightly nightclub-style performances, and the Skywalkers Nightclub is an amazing dance club with a view from 15 decks above the ocean!